The settings usually always worked. Reason why I’m saying “usually always” is that some of new front end tools like Analysis for Office (AfO) do not consider the settings. I came to know this by trying it out in AfO. I was wondering why it doesn’t work in AfO whereas it worked while running the same query in BEx Query Analyzer. Then I ran into following SAP Note: 2299020 - Analysis Office does not evaluate Hide Repeated Key Values from Query definition. 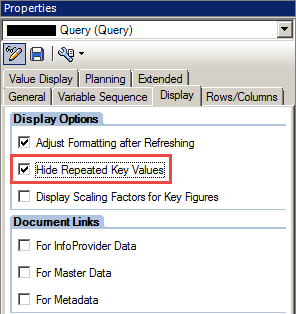 Query Analyzer: Hide Repeated Key Values -> You can specify whether identical key values are to be displayed more than once in the query. The Hide Repeated Key Values setting is active by default, so that only the first key value is displayed for each characteristic and additional, identical key values are hidden. Analysis for Office: Repeat Members -> The setting made in BEx Query Designer to hide/show repeated key values is not evaluated in Analysis. To define the display for repeated members only this setting in the design panel is evaluated. To employ the setting in case of AfO there is a checkbox called “Repeat Members” on tab Components -> select particular DataSource -> Crosstab x.